The Diamond Island "Stone Boat" was one of hundreds of wooden canal boats that transported cargo throughout the Lake and Champlain Canal. The name of this boat, who owned her, and when she navigated the lake have not yet been determined. Similar in size and construction to the coal barge A.R. Noyes, the Stone Boat is a flat-bottomed, vertically-sided vessel. There is no evidence of an engine, nor of masts and sails, indication that she had no independent means of propulsion. She was instead towed from port to port by a tugboat, or by mules on the canal. Line drawing of the Diamond Island Stone Boat. On her last voyage the boat carried a load of quarried stone that filled her hold from stem to stern. The circumstances of her sinking are unknown, but most likely she was separated from her tow, leaving her to drift onto the rocky shore of Diamond Island; or, the immense weight of stone in her hold may have stressed the hull, opening seams in the planking and forcing her owners to attempt to save the cargo and hull by running her ashore. Efforts to save the vessel were obviously unsuccessful. The stem extends 8' above the bottom and is reinforced by several heavy timbers. 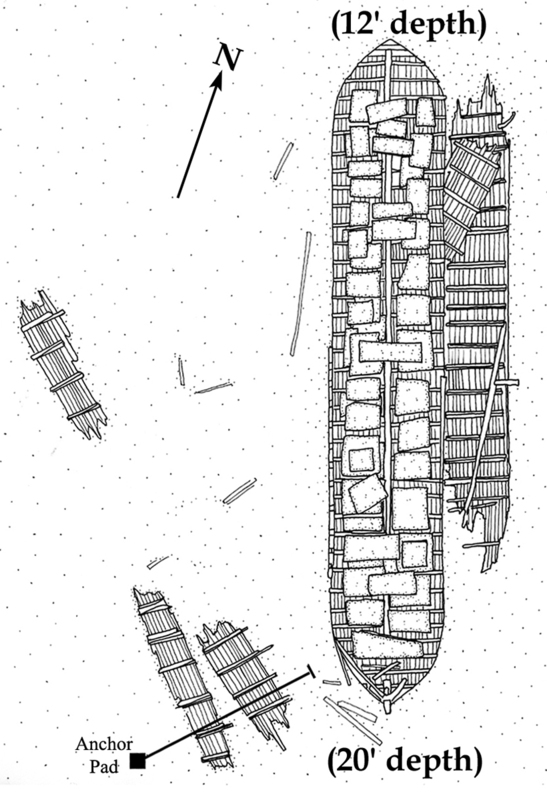 The cargo of stone blocks lies stacked upon the frames over the length of the wreck. The hull's frame timbers and keelson are visible between the blocks. In the decades since the boat sank, her sides have been broken down by decay and winter ice, and now lie on the bottom on both sides of the wreck. Depth of water: 12'–20' Never leave your boat unattended. If you are swept off the wreck someone in your boat must be prepared to pick you up. This is a popular fishing site. Watch for fishing line and carry a knife. Immediately off the southeast side of Diamond Island.